The global cinnamon market is expected to witness significant growth attributed to increasing demand for healthy food products. Growing prevalence of various diseases is further expected to impact growth of the global cinnamon market during the forecast period. Attributed to various healthy properties, demand for cinnamon will continue to remain high in the food and beverage, and healthcare industry. In order to offer dermal solutions for various skin diseases and infections, manufacturers are increasingly using cinnamon in various medicines. Further, cinnamon continues to witness significant demand in the cosmetic industry bound to various health benefits. The report offers in-depth insight on the crucial aspects of the global cinnamon market and provides information regarding data related to the factors impact growth of the global market, competitive landscape growth patterns and important segment. Growth of the global cinnamon market is mainly bound with various macro-economic and micro-economic factors. The report reveals that the global cinnamon market is mainly driven by increasing prevalence of various gynecological illness, respiratory illness and digestive illness. Prevalence of diseases such as Parkinson’s disease, Alzheimer’s disease, HIV and multiple sclerosis has led the manufacturers in the pharmaceutical industry to increasingly opt for cinnamon as an important ingredient during the production of medicines. Growing prevalence of diabetes is further expected to impact growth of the global market during the forecast period. Increasing consumption of type II diabetes is expected to rev up demand for cinnamon among the manufacturers in the pharmaceutical industry. Attributed to anti-inflammatory, anti-carcinogenic, antifungal and antioxidant properties, cinnamon will continues to witness significant demand in the food and beverages, cosmetic, and healthcare industry, Manufacturers are increasingly opting for cinnamon as a flavor enhancer and boost healthy attributes in the global market. Attributed to various health benefits, consumption of cinnamon continues to remain high among the cosmetic manufacturers globally. Increasing application of cinnamon in dermal gels and medicines is further expected to impact growth of the global cinnamon market. With the growing prevalence of the skin diseases, infections and skin disorders, manufacturers in the pharmaceutical and cosmetic industries are increasingly using the cinnamon during the production process. Such factors will continue to impact growth of the global cinnamon market positively. In the next section, the global cinnamon market is segmented into product type, form, application type and distribution channel. On the basis of product type, the global market is segmented as cassia, saigon, ceylon and other. Based on form, the global market is segmented as quills, chips, featherings, powder, bark oil, leaf oil and other forms. On the basis of application type, the global market is segmented as culinary uses, spice mixes, bakery, chocolate and confectionery, beverages, soups and sauces and other application types. By distribution channel, the global market is segmented as modern trade, traditional grocery store, convenience stores, online channels and other retail formats. Key players in the global cinnamon market are Pure Ceylon Cinnamon, HDDES Group, Adam Group, Ceylon Spice Company, SDS SPICES (PVT) LTD., Bio Foods (Pvt) Ltd., Ceylon Spice Company, C.F. Sauer Company, Elite Spice, Mc Cormick Spices, EHL Ingredients and First Spice Mixing Company. Growing need for increasing the insulin sensitivity in the body will continue to boost demand for cinnamon in the global market. Prevalence of gynecological issues, respiratory illness and digestive problems is expected to fuel growth of the global market. As cinnamon is bound by antiviral, antibacterial, anti-carcinogenic and antifungal properties, consumption of cinnamon is expected to remain high in various food products. Consumption of cinnamon continues to remain high among the diabetic patients bound to various health benefits globally. According to Persistence Market Research, the global cinnamon market is expected to represent a value of over US$ 3,500 Mn by the end of 2026. As people are becoming more aware regarding the healthy attributes, cinnamon is expected to witness significant demand in the food and beverages industry. 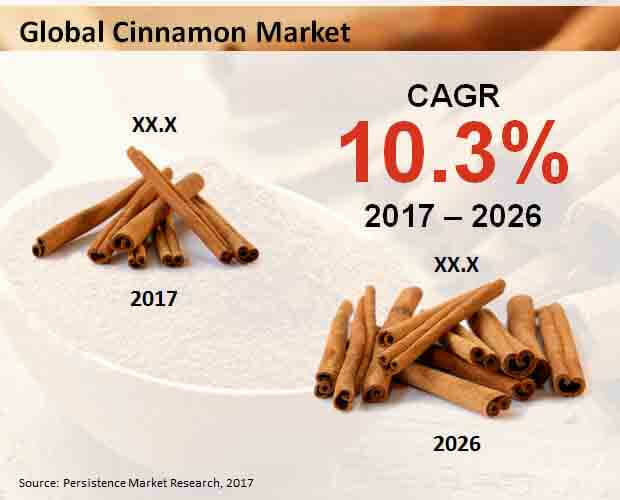 With the growing need to flavor various food products continue to increase, demand for cinnamon is likely to remain high. Sales of cinnamon is mainly bound to surge in demand for various food products in the global market. With the growing demand for chocolate dishes and sweets has further contributed towards growth of the global market during the forecast period. In order to benefit from healthy features of cinnamon, consumption of cinnamon continues to extend towards tea and coffee. Preference for cinnamon flavor has led the food industry to increasingly use cinnamon in various bakery products as well. Growth of the global market is likely to gain momentum bound to these factors. Demand for cinnamon continues to gain momentum bound to growing need to control the blood pressure and improve diabetic conditions. Moreover, prevalence of various digestive diseases is further expected to impact growth of the global market positively. Parkinson’s disease, Alzheimer’s disease, chronic wounds, multiple sclerosis and HIV are some of the common medical conditions that can improve with consumption of cinnamon. Consumption of cinnamon continues to lower the cholesterol level among the type I and II diabetic patients. With the increasing consumption of cinnamon, the blood sugar level will enable the diabetic patients with blood sugar level to lose weight in the global market. Bound to these factors, demand for cinnamon continues to remain high in the global market. Cinnamon is rich in antioxidants, antifungal, anti-carcinogenic and anti-inflammatory properties. Attributed to the anti-inflammatory and anti-fungal properties, manufacturers are increasingly using cinnamon for the production of medicines such as felbinac, ibuprofen, piroxicam, diclofenac and ketoprofin. Growing prevalence of skin disorders, infections and diseases has led to surge in demand for cinnamon in the pharmaceutical industry. Demand for cinnamon is expected to gain momentum due to growing prevalence of eczema, acne and pimples. Cosmetic manufacturers are increasingly using cinnamon for production of the anti-acne face masks, face scrubs and hair growth treatment solutions. Increasing production of the facial cosmetic products will continue to impact growth of the global market positively. Growing need to boost the immune system has led to an upsurge in demand for cassia cinnamon globally. On the basis of product type, the cassia segment is expected to represent the highest revenue growth, accounting for a value of over US$ 600 Mn by the end of 2026. On the other hand, the saigon product type segment is expected to register robust CAGR throughout the forecast period. Based on form, the quills segment is expected to generate significant revenues, recording a value of over US$ 200 Mn by the end of 2017. However, the powder form segment is expected to register the highest CAGR through 2022. By application type, the culinary uses segment is expected to witness a major growth in terms of revenue, accounting for a value of over US$ 500 Mn by the end of 2026. In contrary to this, the bakery application type segment is expected to register a healthy CAGR during the forecast period. On the basis of distribution channel, the modern trade segment is expected to represent the highest growth in terms of revenue, recording a value of over US$ 200 Mn by the end of 2017. However, the online channels distribution channel segment is expected to witness significant CAGR by 2026-end. Leading market players operating in the global cinnamon market include Pure Ceylon Cinnamon, Adam Group, Bio Foods (Pvt) Ltd., HDDES Group, SDS SPICES (PVT) LTD., Ceylon Spice Company, Elite Spice, First Spice Mixing Company, C.F. Sauer Company, EHL Ingredients and Mc Cormick Spices.